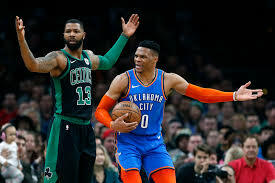 BOSTON (AP) – Kyrie Irving had 30 points and 11 assists, Marcus Morris scored 19 points, and the Boston Celtics snapped the Oklahoma City Thunder’s league-best seven-game win streak with a 134-129 victory. Marcus Smart added 18 points and seven assists, Al Horford scored 17 points and Daniel Theis had 14 off the Celtics bench. Boston has won four straight since falling short against Golden State on Jan. 26 and nine of its last 10 games overall.